The quick and easy crust is made from the Simple Mills mix, primarily from almond flour, making it grain-free and gluten-free. 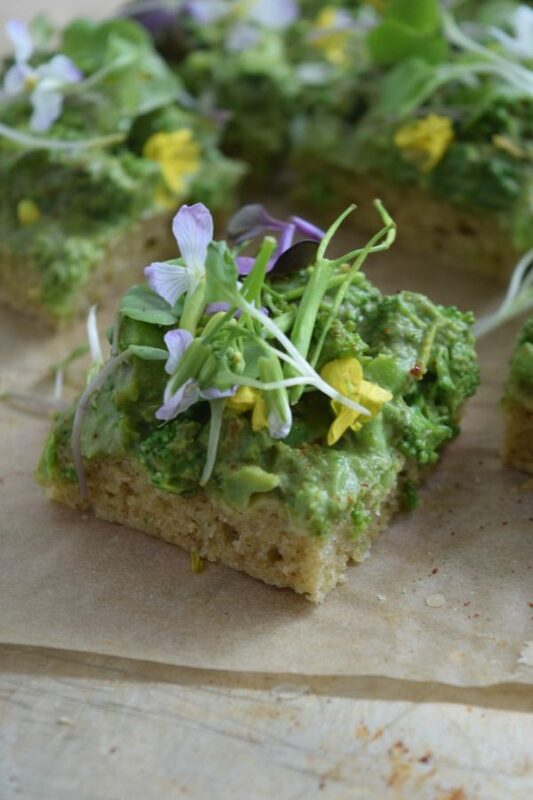 The dairy-free yet creamy broccoli and basil-pea-pesto topping will have everyone going back for seconds. The best part? It’s ready in less than 30 minutes! 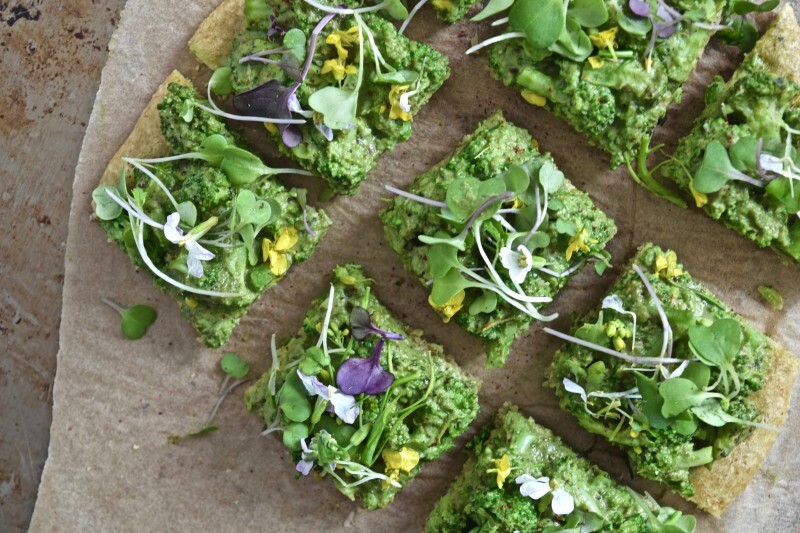 I love adding broccoli sprouts, or other sprouts on top for an added nutritional boost. For dough, I love to use the Simple Mills Artisan bread mix. Out of all the gluten-free bread mixes I’ve tried, Simple Mills has the best ingredients and tastes amazing. For olive oil, I have tried so many, and find this Gaea olive oil to be my favorite. I like that it is in a dark glass bottle to protect the antioxidants in the oil, its a nice deep yellow color, and it is very tasty. I find compared to other olive oils, it’s truly high quality at a good price. You could also use avocado oil instead. For apple cider vinegar, I prefer Bragg’s Organic Raw Apple Cider Vinegar. It’s unfiltered and contains the “mother”. First, make the crust. Heat oven to 350° F.
Whisk eggs, water, oil and vinegar in a large bowl. Add baking mix; combine well. Let dough sit 4 minutes (dough will thicken). Divide dough into two equal portions and place on greased or parchment-lined cookie sheet. Run hands under water to moisten to prevent sticking and shape into two 7" circles. Bake 15 minutes. Meanwhile, make the pea pesto. Combine all pesto ingredients in a blender, and blend on high until smooth. Set aside. Then, blanch the broccoli: Bring a large pot of water with a pinch of salt to a boil. Fill a large bowl with water and 2 cups of ice and place on the side. Add the broccoli florets to the pot of boiling water, cook for 90-seconds to 2 minutes, until bright green. Use a slotted spoon to remove the broccoli to the ice bath to cool down and stop cooking. After 2 minutes, drain, and in a bowl, combine the broccoli and pesto and mix well. 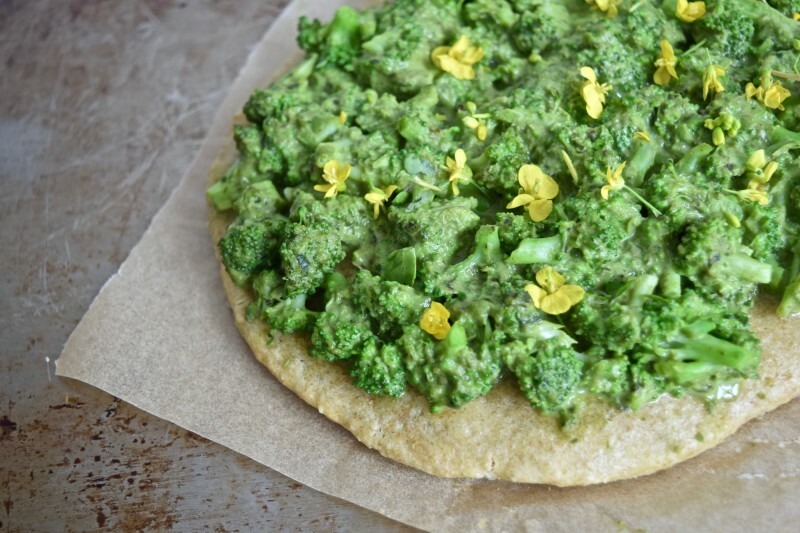 When the flatbreads come out of the oven, spread the broccoli/pesto mixture on top. Return to the oven for another 5 minutes. Remove from the oven, garnish with red pepper flakes, basil leaves, or sprouts, if desired. Cut each flatbread into 12 squares.